This article is about the Russian politician. For the fictional character, see List of BattleTech characters § Aleksandr Kerensky. Alexander Fyodorovich Kerensky (Russian: Алекса́ндр Фёдорович Ке́ренский, IPA: [ɐlʲɪˈksandr ˈkʲerʲɪnskʲɪj]; Russian: Александръ Ѳедоровичъ Керенскій; 4 May 1881 – 11 June 1970) was a Russian lawyer and revolutionist who was a key political figure in the Russian Revolution of 1917. After the February Revolution of 1917, he joined the newly formed Russian Provisional Government, first as Minister of Justice, then as Minister of War, and after July as the government's second Minister-Chairman. A leader of the moderate-socialist Trudovik faction of the Socialist Revolutionary Party, he was also vice-chairman of the powerful Petrograd Soviet. On 7 November, his government was overthrown by the Lenin-led Bolsheviks in the October Revolution. He spent the remainder of his life in exile, in Paris and New York City, and worked for the Hoover Institution. Alexander Kerensky was born in Simbirsk (now Ulyanovsk) on the Volga River on 4 May 1881 and was the eldest son in the family. His father, Fyodor Mikhailovich Kerensky, was a teacher and director of the local gymnasium and was later promoted to Inspector of public schools. His maternal grandfather was head of the Topographical Bureau of the Kazan Military District. His mother, Nadezhda Aleksandrovna (née Adler), (the first-name Nadezhda meaning "Hope"; her patronymic last or "maiden" name was Kalmykova), was the daughter of a former serf who had had to purchase his freedom before serfdom was abolished in 1861. He subsequently embarked upon a mercantile career, in which he prospered, allowing him to move his business to Moscow, where he continued his success, becoming a wealthy Moscow merchant. Kerensky's father was the teacher of Vladimir Ulyanov (Lenin), and members of the Kerensky and Ulyanov families were friends. In 1889, when Kerensky was eight, the family moved to Tashkent, where his father had been appointed the main inspector of public schools (superintendent). Alexander graduated with honours in 1899. The same year he entered St. Petersburg University, where he studied history and philology. The next year he switched to law. He earned his law degree in 1904 and married Olga Lvovna Baranovskaya, the daughter of a Russian general, the same year. Kerensky joined the Narodnik movement and worked as a legal counsel to victims of the Revolution of 1905. At the end of 1904, he was jailed on suspicion of belonging to a militant group. Afterwards he gained a reputation for his work as a defence lawyer in a number of political trials of revolutionaries. In 1912, Kerensky became widely known when he visited the goldfields at the Lena River and published material about the Lena Minefields incident. In the same year, Kerensky was elected to the Fourth Duma as a member of the Trudoviks, a moderate, non-Marxist labour party founded by Alexis Aladin that was associated with the Socialist-Revolutionary Party, and joined a Freemason society uniting the anti-monarchy forces that strived for the democratic renewal of Russia. In fact, the Socialist Revolutionary Party bought Kerensky a house, as he otherwise wouldn't be elective for the Duma, according to the Russian property-laws. He then soon became a significant Duma member of the Progressive Block, which included several Socialist Parties, Mensheviks, and Liberals - but not the Bolsheviks. He was a brilliant orator and skilled parliamentary leader of the socialist opposition to the government of Tsar Nicholas II. On May 28, 1914, Kerensky appealed to Rodzianko with a request from the Council of elders to inform the Tsar that to succeed in war he must: 1) change his domestic policy, 2) proclaim a General Amnesty for political prisoners, 3) restore the Constitution of Finland, 4) declare the autonomy of Poland, 5) provide national minorities autonomy in the field of culture, 6) abolish restrictions against Jews, 7) end religious intolerance, 8) stop the harassment of legal trade union organizations. Kerensky was an active member of the irregular Freemasonic lodge, the Grand Orient of Russia's Peoples, which derived from the Grand Orient of France. Kerensky was Secretary General of the Grand Orient of Russia's Peoples and stood down following his ascent to government in July 1917. He was succeeded by Menshevik, Alexander Halpern. In response to bitter resentments held against the imperial favourite Grigori Rasputin in the midst of Russia's failing effort in World War I, Kerensky, at the opening of the Duma on 2 November 1916, called the imperial ministers "hired assassins" and "cowards", and alleged that they were "guided by the contemptible Grishka Rasputin!" Grand Duke Nikolai Mikhailovich, Prince Lvov, and general Mikhail Alekseyev attempted to persuade the emperor Nicholas II to send away the Empress Alexandra Feodorovna, Rasputin's steadfast patron, either to the Livadia Palace in Yalta or to England. Mikhail Rodzianko, Zinaida Yusupova (the mother of Felix Yusupov), Alexandra's sister Elisabeth, Grand Duchess Victoria and the empress's mother-in-law Maria Feodorovna also tried to influence and pressure the imperial couple to remove Rasputin from his position of influence within the imperial household, but without success. According to Kerensky, Rasputin had terrorised the empress by threatening to return to his native village. Monarchists murdered Rasputin in December 1916, burying him near the imperial residence in Tsarskoye Selo. Shortly after the February Revolution of 1917, Kerensky ordered soldiers to re-bury the corpse at an unmarked spot in the countryside. However, the truck broke down or was forced to stop because of the snow on Lesnoe Road outside of St. Petersburg. It is likely the corpse was incinerated (between 3 and 7 in the morning) in the cauldrons of the nearby boiler shop of the Saint Petersburg State Polytechnical University, including the coffin, without leaving a single trace. When the February Revolution broke out in 1917, Kerensky - together with Pavel Milyukov - was one of its most prominent leaders. As one of the Duma's most well-known spacers[clarification needed] from the monarchy and as a lawyer and defender of many revolutionaries, Kerensky became a member of the Provisional Committee of the State Duma and was elected vice-chairman of the newly formed Petrograd Soviet. These two bodies, the Duma and the Petrograd Soviet, or - rather - their respective executive committees, soon became each other's antagonists on most matters except regarding the end of the Tsar's autocracy. The Petrograd Soviet grew to include 3000 to 4000 members, and their meetings could drown in a blur of everlasting orations. At the meeting of 12 March [O.S. 27 February] 1917 to 13 March [O.S. 28 February] 1917 the Executive Committee of the Petrograd Soviet or Ispolkom formed - a self-appointed committee, with (eventually) three members from each of the parties represented in the Soviet. Kerensky became one of the members representing the Social Revolutionary party (the SRs). On 14 March [O.S. 1 March] 1917, without any consultation with the government, the Ispolkom of the Soviet issued the infamous Order No. 1, intended only for the 160,000-strong Petrograd garrison, but soon interpreted as applicable to all soldiers at the front. 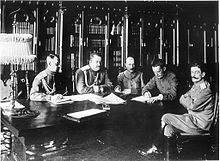 The order stipulated that all military units should form committees like the Petrograd Soviet. This led to confusion and "striping of officers", further "Order No. 3" stipulated that the military was subordinate to Ispolkom in the political hierarchy. The ideas came from a group of Socialists and aimed to limit the officers' power to military affairs. The socialist intellectuals believed the officers to be the most likely counterrevolutionary elements. Kerensky's role in these orders are unclear, but he participated in the decisions. But just as before the revolution he had defended many who disliked the Tsar, he now saved the lives of many[quantify] of the Tsar's civil servants about to be lynched by mobs. Additionally, the Duma formed an executive committee which eventually became the so-called Russian Provisional Government. 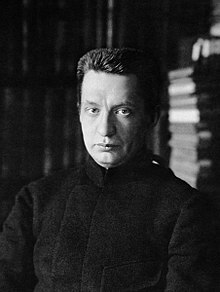 As there was little trust between Ispolkom and this Government (and as he was about to accept the office of Attorney General in the Provisional Government), Kerensky gave a most passionate speech, not just to the Ispolkom, but to the entire Petrograd Soviet. He then swore, as Minister, never to violate democratic values, and ended his speech with the words "I cannot live without the people. In the moment you begin to doubt me, then kill me." The huge majority (workers and soldiers) gave him great applause, and Kerensky now became the first and the only one who participated in both the Provisional Government and the Ispolkom. As a link between Ispolkom and the Provisional Government, the quite ambitious Kerensky stood to benefit from this position. After the first government crisis over Pavel Milyukov's secret note re-committing Russia to its original war-aims on 2–4 May, Kerensky became the Minister of War and the dominant figure in the newly-formed socialist-liberal coalition government. On 10 May (Julian calendar), Kerensky started for the front and visited one division after another, urging the men to do their duty. His speeches were impressive and convincing for the moment, but had little lasting effect. Under Allied pressure to continue the war, he launched what became known as the Kerensky Offensive against the Austro-Hungarian/German South Army on 1 July [O.S. 18 June] 1917. At first successful, the offensive soon met strong resistance and the Central Powers riposted with a strong counter-attack. The Russian army retreated and suffered heavy losses, and it became clear from the many incidents of desertion, sabotage, and mutiny that the army was no longer willing to attack. The military heavily criticised Kerensky for his liberal policies, which included stripping officers of their mandates and handing over control to revolutionary-inclined "soldier committees" (Russian: солдатские комитеты, translit. soldatskie komitety) instead; the abolition of the death penalty; and allowing revolutionary agitators to be present at the front. Many officers jokingly referred to commander-in-chief Kerensky as the "persuader-in-chief"
On 2 July 1917 the Provisional Government's first coalition collapsed over the question of Ukraine's autonomy. Following the July Days unrest in Petrograd (3–7 July [16–20 July, N.S.] 1917) and the official suppression of the Bolsheviks, Kerensky succeeded Prince Lvov as Russia's Prime Minister on 21 July [O.S. 8 July] 1917. Following the Kornilov Affair, an attempted military coup d'état at the end of August, and the resignation of the other ministers, he appointed himself Supreme Commander-in-Chief as well. On 15 September Kerensky proclaimed Russia a republic, which was contrary to the non-socialists' understanding that the Provisional Government should hold power only until a Constituent Assembly should meet to decide Russia's form of government, but which was in line with the long-proclaimed aim of the Socialist Revolutionary Party. He formed a five-member Directory, which consisted of himself, Minister of Foreign Affairs Mikhail Tereshchenko, Minister of War General Aleksandr Verkhovsky [ru], Minister of the Navy Admiral Dmitry Verderevsky and Minister of Posts and Telegraphs Aleksei Nikitin [ru]. He retained his post in the final coalition government in October 1917 until the Bolsheviks overthrew it on 7 November [O.S. 26 October] 1917. Kerensky faced a major challenge: three years of participation in World War had exhausted Russia, while the provisional government offered little motivation for a victory outside of continuing Russia's obligations towards its allies. Russia's continued involvement in the war was not popular among the lower and middle classes, and especially not popular among the soldiers. They had all believed that Russia would stop fighting when the Provisional Government took power, and subsequently felt deceived. Furthermore, Vladimir Lenin and his Bolshevik party were promising "peace, land, and bread" under a communist system. The Russian army, war-weary, ill-equipped, dispirited and ill-disciplined, was disintegrating, with soldiers desertiing in large numbers. 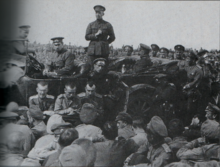 By autumn 1917, an estimated two million men had unofficially left the army. Kerensky and the other political leaders continued Russia's involvement in World War I, thinking that nothing but a glorious victory was the only road forward, and fearing that the economy, already under huge stress from the war effort, might become increasingly unstable if vital supplies from France and from the United Kingdom ceased flowing. The dilemma of whether to withdraw was a great one, and Kerensky's inconsistent and impractical policies further destabilised the army and the country at large. Furthermore, Kerensky adopted a policy that isolated the right-wing conservatives, both democratic and monarchist-oriented. His philosophy of "no enemies to the left" greatly empowered the Bolsheviks and gave them a free hand, allowing them to take over the military arm or "voyenka" (Russian: Военка) of the Petrograd and Moscow Soviets. His arrest of Lavr Kornilov and other officers left him without strong allies against the Bolsheviks, who ended up being Kerensky's strongest and most determined adversaries, as opposed to the right wing, which evolved into the White movement. During the Kornilov Affair, Kerensky had distributed arms to the Petrograd workers, and by November most of these armed workers had gone over to the Bolsheviks. On 6–7 November [O.S. 25–26 October] 1917, the Bolsheviks launched the second Russian revolution of the year. Kerensky's government in Petrograd had almost no support in the city. Only one small force, a subdivision of the 2nd company of the First Petrograd Women's Battalion, also known as The Women's Death Battalion, was willing to fight for the government against the Bolsheviks, but this force was overwhelmed by the numerically superior pro-Bolshevik forces, defeated, and captured. The Bolsheviks took less than 20 hours to seize the government. 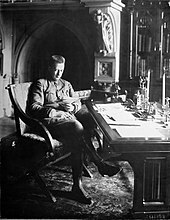 Kerensky escaped the Bolsheviks and fled to Pskov, where he rallied some loyal troops for an attempt to re-take the city. His troops managed to capture Tsarskoe Selo but were beaten the next day at Pulkovo. Kerensky narrowly escaped, and he spent the next few weeks in hiding before fleeing the country, eventually arriving in France. During the Russian Civil War, he supported neither side, as he opposed both the Bolshevik regime and the White Movement. Kerensky was married to Olga Lvovna Baranovskaya and they had two sons, Oleg and Gleb, whom both went on to become engineers. Kerensky's grandson (also named Oleg) played his grandfather's role in the 1981 film Reds. Kerensky and Olga were divorced in 1939 and soon after he settled in Paris, and while visiting the United States he met and married, in 1939, the Australian former journalist Lydia Ellen "Nell" Tritton (1899–1946). The marriage took place in Martins Creek, Pennsylvania. When Germany invaded France in 1940, they emigrated to the United States. After the Nazi-led invasion of the Soviet Union in 1941, Kerensky offered his support to Joseph Stalin. When his wife Nell became terminally ill in 1945, Kerensky travelled with her to Brisbane, Australia, and lived there with her family. She suffered a stroke in February 1946, and he remained there until her death on 10 April 1946. Kerensky then returned to the United States, where he spent the rest of his life. Kerensky eventually settled in New York City, living on the Upper East Side on 91st Street near Central Park but spent much of his time at the Hoover Institution at Stanford University in California, where he both used and contributed to the Institution's huge archive on Russian history, and where he taught graduate courses. He wrote and broadcast extensively on Russian politics and history. Kerensky died of arteriosclerotic heart disease at St. Luke's Hospital in New York City in 1970, one of the last surviving major participants in the turbulent events of 1917. The local Russian Orthodox Churches in New York City refused to grant Kerensky burial, because of his association with Freemasonry and because they saw him as largely responsible for the Bolsheviks seizing power. A Serbian Orthodox Church also refused burial. 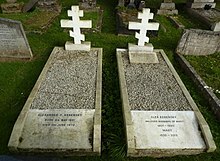 Kerensky's body was flown to London, where he was buried at the non-denominational Putney Vale Cemetery. The Prelude to Bolshevism (1919). ISBN 0-8383-1422-8. Kerensky was portrayed in the 1971 film Nicholas and Alexandra by John McEnery. In the 2008 film The Admiral, Kerensky is portrayed by Viktor Verzhbitsky. Kerensky can make an appearance in the grand strategy game Hearts of Iron IV leading a Trudovik Russia should the Soviet Union change from its communist ideology. In the game's Kaiserreich mod, he appears as the president of Russia, but is assassinated shortly after the game starts. ^ a b "Alexander Kerenski". First World War. Retrieved 1 April 2013. ^ N. Magill, Frank (5 March 2014). The 20th Century Go-N: Dictionary of World Biography, Volume 8. Routledge. p. 1941. ISBN 978-1-317-74060-5. ^ "Александр Федорович Керенский". Archived from the original on 2014-07-25. ^ Political Figures of Russia, 1917, Biographical Dictionary, Large Russian Encyclopedia, 1993, p. 143. ^ "Prominent Russians: Aleksandr Kerensky". Russia: RT. Retrieved 23 April 2014. ^ Medlin, Virgil D. (1971). "Alexander Fedorovich Kerensky" (PDF). Proceedings of the Oklahoma Academy of Science. 51: 128. Archived from the original (PDF) on 4 March 2016. ^ "Grigori Rasputin: Belied Life - Belied Death". www.omolenko.com. Retrieved 20 January 2019. ^ "Alexander Kerensky. The Democrat in charge of Russia". Retrieved 20 January 2019. ^ A. Kerensky (1965) Russia and History's turning point, p. 150. ^ "Alexandra Feodorovna and Romanov Russia, The Real Tsaritsa witten by Lili Dehn - Part One - Old Russia - Chapter V". www.alexanderpalace.org. Retrieved 20 January 2019. ^ A. Kerensky (1965) Russia and History's turning point, p. 163. ^ Rasputin G. E. (1869–1916). A.G. Kalmykov in the Saint Petersburg encyclopaedia. ^ Nelipa, pp. 454–455, 457–459. 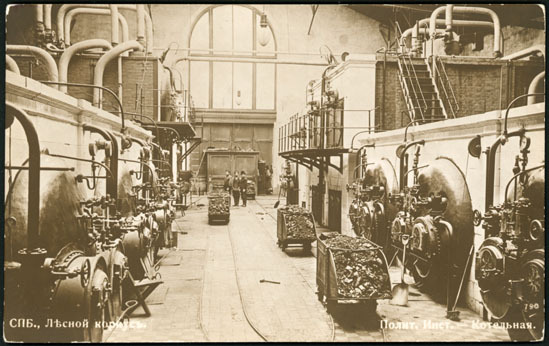 ^ "The boiler-building – Images of St Petersburg – National Library of Russia". Retrieved 20 January 2019. ^ "Women Soldiers in Russia's Great War". Great War. Retrieved 1 April 2013. ^ Armstrong, Judith. Australian Dictionary of Biography. National Centre of Biography, Australian National University. Retrieved 20 January 2019 – via Australian Dictionary of Biography. ^ Soviet's Chances. By Alexander Kerensky. Life, 14 July 1941, pp. 76-78, 81. ^ "Lateline - 22/09/2003: The Half-Hearted Revolutionary In Paradise . Australian Broadcasting Corp". www.abc.net.au. Archived from the original on 31 July 2016. Retrieved 20 March 2017. ^ a b c "Alexander Kerensky Dies Here at 89". New York Times. ^ Canby, Vincent (14 December 1971). "' Nicholas and Alexandra' Depicts Fall of Romanovs". Retrieved 20 January 2019 – via NYTimes.com. ^ "Admiral (2008)". Retrieved 20 January 2019 – via www.imdb.com. Abraham, Richard (1987). Kerensky: First Love of the Revolution. Columbia University Press. ISBN 0-231-06108-0. Lipatova, Nadezhda V. "On the Verge of the Collapse of Empire: Images of Alexander Kerensky and Mikhail Gorbachev." Europe-Asia Studies 65.2 (2013): 264-289. Thatcher, Ian D. "Memoirs of the Russian Provisional Government 1917." Revolutionary Russia 27.1 (2014): 1-21. Wikimedia Commons has media related to Alexander Kerensky. The Kornilov affair, or the Kornilov putsch, was an attempted military coup d'état by the Commander-in-Chief of the Russian Army, General Lavr Kornilov, from 10 to 13 September 1917 against the Russian Provisional Government headed by Aleksander Kerensky and the Petrograd Soviet of Soldiers' and Workers' Deputies. The exact details and motivations of the Kornilov affair are unconfirmed due to the general confusion of all parties involved. Many historians have pieced together varied historical accounts as a result. Vladimir Mitrofanovich Purishkevich was a right-wing politician in Imperial Russia, noted for his monarchist, ultra-nationalist, antisemitic and anticommunist views. Because of his restless behaviour, he was regarded as a loose cannon. At the end of 1916, he participated in the killing of Grigori Rasputin. 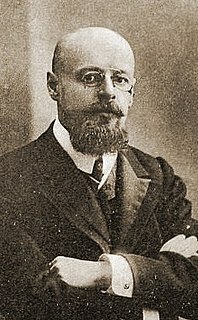 Matvey Ivanovich Skobelev was a Russian Marxist revolutionary and politician. Nikolai Dimitrovich Avksentiev was a leading member of the Russian Socialist-Revolutionary Party (PSR). He was one of the 'Heidelberg SRs', like V.M. Zenzinov. These SRs were influenced by neo-Kantian philosophy and Marxism.